General Description: Joyful Journey Hot Springs is formerly known as the Mineral Hot Springs. This beautiful rustic hot springs is located in a gorgeous part of the San Luis Valley in Idaho Springs, Colorado and has spectacular views. ​ The source is from the travertine springs. The hot springs resort offers three mineral hot springs and offer a full menu of massage, facial choices and accommodations. Location: From Pueblo, Colorado it is 130 miles or 2 1/2 hours. Accessibility: Joyful Journey Hot Springs is very accessible. You can drive right up to the resort. Once at the resort it is an easy walk. The facility is handicap accessible. Hot Springs: Joyful Journey Hot Springs the source is from the travertine springs. The temperature of the source at this resort is 145 degrees. The hot springs resort has three mineral hot springs. All the pools are gravity fed with artesian water. The hot spring pools temperatures range between 98-108 degrees. The 98°F cool pool is perfect for those with low tolerance of hot water and that still want to get the benefit of our minerals. The 104°F tower pool is a great middle temperature for soaking. The 108°F hot pool is an ideal temperature. Hot Spring Tips: The hot springs pools are drained and cleaned nightly. Free Birthday Pool Pass with ID. 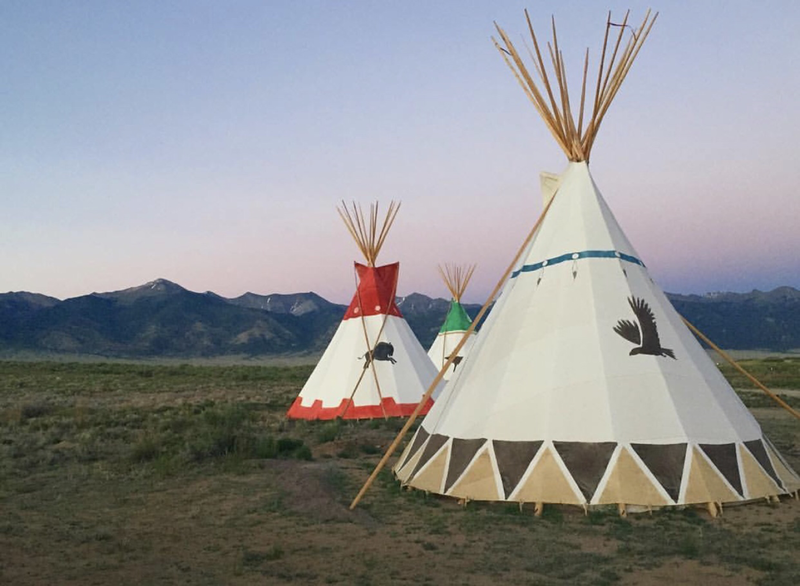 Joyful Journey offers a variety of accommodations, ranging from our gorgeous hotel rooms with private bathrooms and aspen-wood furniture, to our native tipis, RV and camp sites, or our yurts – the round canvas buildings. Suite, towel, and robe rental available. Check out the Indian tee pees. This hot springs is pet friendly. On-site self service kennel available. Bathing suits are required. Definitely walk the rock labyrinth on the property. Youtube Video on Joyful Journey Hot Springs is below.